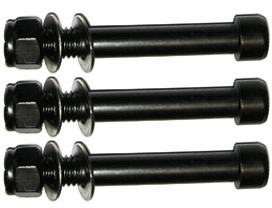 3 Allen key bolts with crews and 6 washers. Used to bolt the folding mechanism of JD Bug Pro & Razor Pro kick scooters. This way it is no longer collapsable, but instead the stability of the kick scooter is increased dramatically. The original folding mechanism must be removed, and the 3 bolts are mounted.